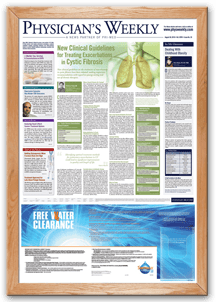 For more than 30 years, Physician’s Weekly has been a trusted source of medical news and information for healthcare professionals at the point of care. Our unique wallboard publication—the cornerstone of our success—is located in over 10,000 top medical institutions in the country. Physician’s Weekly offers in-depth interviews with the most highly respected experts in the industry who weigh in on landmark research and trending topics affecting the medical community. Physician’s Weekly also offers physicians and other healthcare professionals accredited Continuing Medical Education (CME) activities. Physician’s Weekly, LLC, is a division of M|C Holding Corp.